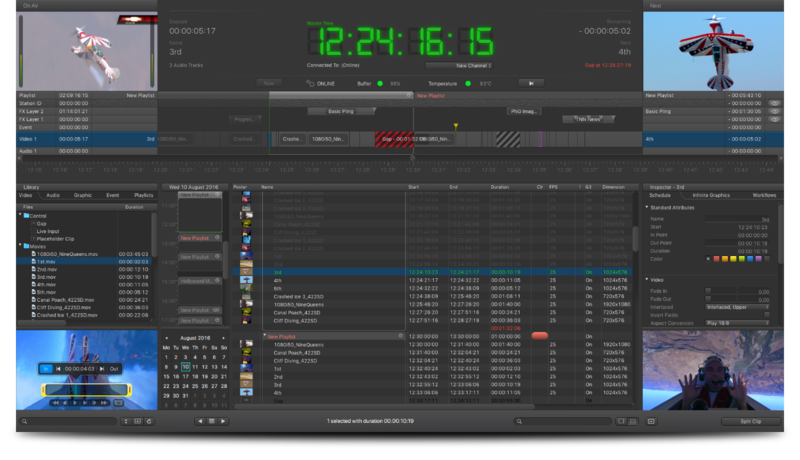 Featuring an intuitive user interface, just:play empowers broadcasters to schedule and manage their playout, even while a clip is already on air. This is possible while having an unlimited number of users working concurrently on the same channel (depending on the user rights defined for this channel). just:play’s easy-to-use, timeline-based interface enables users to schedule content days or even weeks in advance, while providing a traditional list view with metadata support. just:play’s versatile graphical user interface provides an unlimited, frame accurate review and preview of all scheduled video items via the timeline or the preview windows. At any time during the scheduling process, just:play gives you full control of the rundown. Gaps and overlays are easily visible and just:play’s playlist-based design makes it easy to structure the rundown. just:play supports major broadcast file formats and codecs (see below). It imports a wide variety of industry standard playlists using XML. just:play will compose videos and multiple layers of realtime graphics and play them out as an SDI signal and/or an IP-stream – simultaneously using a single hardware. just:play delivers the high-quality video and audio playout you expect from a professional broadcast environment by using Apple’s pristine ProRes codec or uncompressed video. On top of that, interactive realtime graphics can be used to display live source data (i.e. news tickers, stock exchange, weather feeds). The tight integration with composition:builder – ToolsOnAir’s graphics template creation tool – enables pre-produced templates to be dropped into a graphics layer (on top of the video layer), allowing content changes to be made during playout and delivered in realtime. * some containers may not support all of the listed codecs.